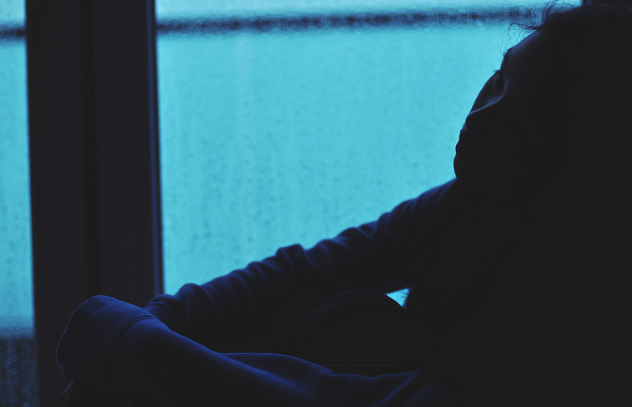 Athazagoraphobia can be seen in patients with dementia in their initial stages or in patients suffering from different medical conditions characterized with memory loss. Such patients fear of forgetting their own identity as well as other important things. Athazagoraphobia may be also seen in patient with Alzheimer’s/dementia patients where patients believe their loved ones will forget them eventually or that they would be forgotten after the loved one has passed. It has been showed that this specific type of phobia can be also seen in childhood where one has been left alone or been ignored for long term period. Except its relation with mental disorders athazagoraphobia can also occur by itself. Those with narcissistic personality disorder may also suffer from athazagoraphobia, as well. The American Psychiatric Association does not recognize athazagoraphobia as a specific phobia or a mental disorder for diagnosing in the DSM-V. So, unless worries are so intense that just thinking about meeting people and facing the potential of being forgotten, replaced or ignored by them frighten you to a point where you can’t function properly you can not be diagnosed to have athazagoraphobia. Suffix -phobia at the end does not necessarily mean that the word stands for an existing mental disorder. Athazagoraphobia is pronounced as uh-THAZZ-uh-gore-uh-foe-bee-uh. 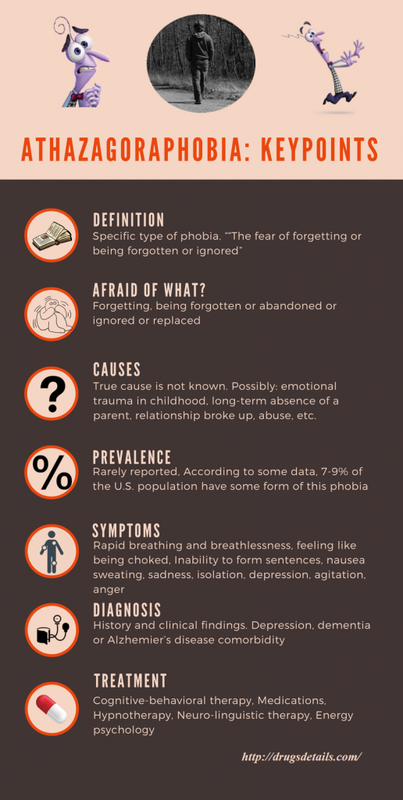 While rarely reported, it is actually quite a common phobia. According to some data, 7-9% of the U.S. population have some form of athazagoraphobia. What are patients with athazagoraphobia afraid of? Patients with athazagoraphobia usually have low self-confidence and self-esteem. Often, such patients are characteristically introverted, have depression or have a lack of the ability to interact normally in society. They are most commonly shy and passive. Also, this phobia is more commonly present in patients who have weak memory or dementia which usually worsens with age. In such patients this fear is manifested usually at the beginning of disease. Some individuals are also afraid of Alzheimer’s disease or other neurodegenerative diseases because their own parent on a person who they know also suffered from these conditions. Ironically, these patients spend hundreds, even thousands of dollars on medicines and supplements in order to improve memory. The symptoms vary from person to person and mostly depend on the type of athazagoraphobia as well as its frequency and severity. Anger and depression are common symptoms of this phobia. Athazagoraphobies usually tend to be isolated rather than face being ignored. They will also do everything possible in order to ensure they are not forgotten: burying mementos in the soil, tying knots around fingers or around trees and so on. The true cause of athazagoraphobia is not known. Fear could have a biological nature caused by brain chemistry changes. The condition could be a result of some emotional trauma in childhood. A parent may have been absent long time during the child’s growth or a parent may have been physically, verbally or emotionally abuse child. The condition could be also provoked because of bad experience during school. In some cases the broke up with the boyfriend or girlfriend may be very traumatic event. Such experience may cause intense fear of abandonment and forgetting. Alternatively, the individual may have forgotten something very important such as the time of a significant job interview or the birthday of a family member. The loss of a job or the loss of respect from one’s family members could also harm a person enough to cause anxiety. As said before, medical disorder characterized with memory loss such as dementia and Alzheimer’s disease may be also root causes of this phobia. Athazagoraphobia is not considered as mental disorder; however it can be diagnosed depending on history and clinical representation. 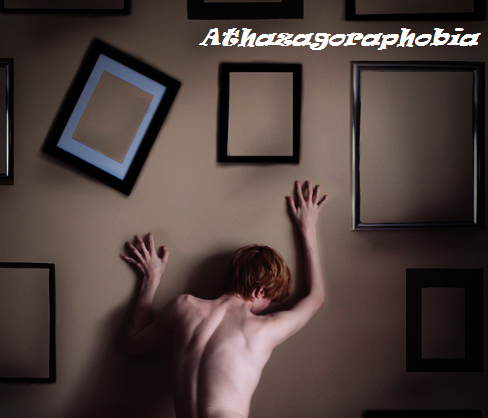 People with athazagoraphobia usually have other illnesses as well such as depression, dementia or Alzhemier’s disease. The main goal of CBT is to eliminate the symptoms of the fear and induce positive thinking. The method involves exposing a patient with athazagoraphobia to a stressful situation and allowing the person to feel the anxiety. The final goal is to make a person desensitized after a period of high exposure. Hypnotherapy in conjunction with fear exposure may be very helpful to detect the emotional triggers and eliminate the irrational phobia. Hypnotherapy needs full patients to in order to bring the patient to the subconscious state without doing anything harmful. Medicines such as anti-anxiety and anti-depressive drugs are sometimes used to relieve severe symptoms with or without panic attacks related to athazagoraphobia. Anxiolytics are useful for short-term use and are very effective in reducing the anxiety symptoms of the person so it can be easier to handle their problem. Benzodiazepines and SSRIs may be used for symptoms management. Xanax and Klonopin are benzodiazepines with properties that can calm nervous system and relive worry of a person. SSRIs are antidepressants, but some of them may work to lessen compulsive activities and obsessive thoughts.